ESPN, the sports television giant, is making a significant, and further, commitment to esports. After agreeing to air live matches of the Overwatch League last year, ESPN recently announced the creation of the College Esports Championship (CEC), a declaration that seems to confirm ESPN’s commitment to the growing popularity of esports. According to the ESPN website, hundreds of schools across North America will compete for a shot at the CEC championship match. The finals will be held in Houston, Texas, May 10-12, during Comicpalooza at the George R. Brown Convention Center. Five titles are being played in the CEC: Overwatch, Hearthstone, Heroes of the Storm, StarCraft II, and Street Fighter V: Arcade Edition. The championship winners will be awarded scholarships. Nearly 130 colleges and universities have dedicated esports programs (a complete list can be found here). In 2014, Robert Morris University was the first university to offer esports scholarships. By July 2016, seven colleges had official varsity esports programs. Now, in less than three years, the number of higher education institutions offering esports programs has multiplied more than 18 times. In addition to the officially sanctioned esports teams, there are also informal, school-approved clubs on colleges and universities across the world. Tespa is probably the largest organization, with more than 270 chapters established by student members across the United States and Canada (it is also backed by the developer Blizzard). Collegiate StarLeague, the world’s first collegiate gaming organization, is another prominent organization. Both groups will help coordinate the qualifying rounds for the CEC. Tespa will run the Overwatch, Hearthstone, StarCraft II, and Heroes of the Storm qualifying rounds, while Collegiate StarLeague will manage Street Fighter V.
“We are thrilled to have the elite collegiate teams from our very first Collegiate StarLeague’s Street Fighter League: US-College 2019 series included in the inaugural ESPN CEC event in Houston. We are looking forward to being part of the great spotlight ESPN will shine on the burgeoning collegiate esports scene as a result of their CEC event,” said Wim Stocks, General Manager and CEO of WorldGaming and Collegiate StarLeague. Only the details for the Street Fighter V online qualifier have been released, so far. The event is taking place on April 20 (registration ends April 19). The tournament will use a 3v3 format, and teams must consist of three players from the same school to compete. There is no fee to enter and no limit to the number of teams that can sign up per school. The top four teams will be flown to Houston for the finals. The event in Houston will be live LAN (local area network) semi-final and championship matches produced and staged by ESPN Events. According to ESPN, certain qualifying rounds and the entire CEC Championship will be streamed globally on various platforms. “We are excited to launch this event with an outstanding lineup of games in a world-class city like Houston. The esports landscape is a growing and dynamic space and will fit nicely into our lineup of ESPN-owned events,” said Clint Overby, Vice President of ESPN Events. This announcement is not the first college esports tournament (although it may now be the biggest). In fact, many of the featured titles have had college tournaments around them. 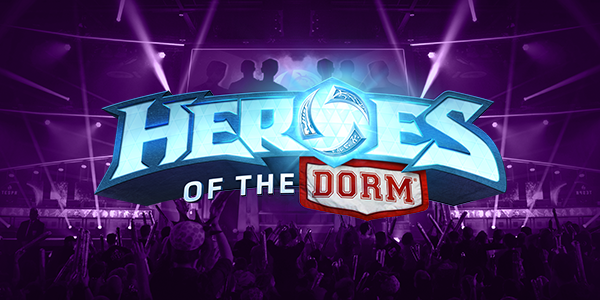 For example, Tespa helped to organize a big championship around Heroes of the Storm, which had the fantastic title of “Heroes of the Dorm.” Late last year it was announced that Blizzard was canceling Heroes of the Dorm and the Heroes Global Championship. As you can imagine, the news that was greeted with a great deal of teeth-gnashing across the internet. In retrospect, however, the cancellation was undoubtedly made to clear the path for this ESPN deal. Another tournament that is being replaced by the CEC Championship is another Tespa organized event, the Overwatch Collegiate Championship, which was held at the Fiesta Bowl. While there are still other collegiate Overwatch competitions, such as the Spring Rally (which is hosted by Overwatch League’s the New York Excelsior) and the 2019 Spring Collegiate Cup (sponsored by another Overwatch League team, the Boston Uprising), the CEC is now officially Overwatch’s only collegiate championship. Currently, the state of collegiate esports is fractured without a single governing body. There are also legitimate concerns that a single governing body, specifically the NCAA, would only serve to complicate matters further instead of smoothing them over. Many of these issues were addressed last year at the Big 12 Conference’s seventh “State of College Athletics” Forum, including whether university esports programs should be housed in the athletics program. Mark Cuban, the owner of the Dallas Mavericks and the NBA 2K League team Mavs Gaming, was asked to participate in the debate. “I think it’d be a big mistake to run it (the esports program) in the athletic department,” said Cuban. “It seems really cool, right? ‘Hey, we’re athletes now, we’re part of the athletics program. We do a lot of the same things.’ But, look what happened in basketball. The same thing is going to happen with esports because of all the money. Whether collegiate esports are eventually housed under the NCAA or continue as they are, one thing is relatively certain: the sport will acquire new programs and fans and continue to grow. If you’re interested in attending the CEC Championship in Houston, individual day tickets and three-day passes can be purchased at www.espnevents.com. Prices start at $15 and top out at $200. If you have any question about the burgeoning field of collegiate esports or for answers to any esports related issues, give one of our EGENCY experts a call at 972-323-6354. 4514 Travis St. # 350, Dallas, TX 75205 - (972) 323-6354 - © 2018 eGency Global All Rights Reserved.